All Ian Moore items listed below are authentic and very limited. We do not carry multiple items. All prices and availability are subject to change. All prices include shipping and handling for all USA customers. All other destinations will require actual shipping cost to complete transaction. Have a question? Ask us before purchasing the item. Thank You. 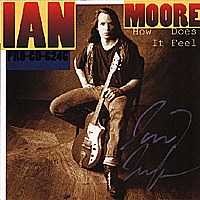 Description: How Does It Feel single CD signed by Ian Moore in pink paint pen. Note: Item signed on Ian Moore's 1995 US tour at TREES in Dallas Texas. Description: Modernday Folklore CD signed by complete band: Ian Moore, Chris White, Bukka and Freddy. CD not included. 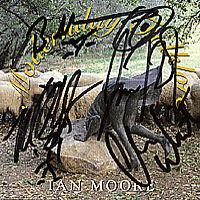 Note: Item signed on Ian Moore's 1998 US tour at Sound Warehouse in Irving Texas. Description: Ian Moore 2015 Show Poster. 12x18 Color. Note: Item signed on Ian Moore's 2015 Texas Tour at Poor David's Pub in Dallas, Texas. 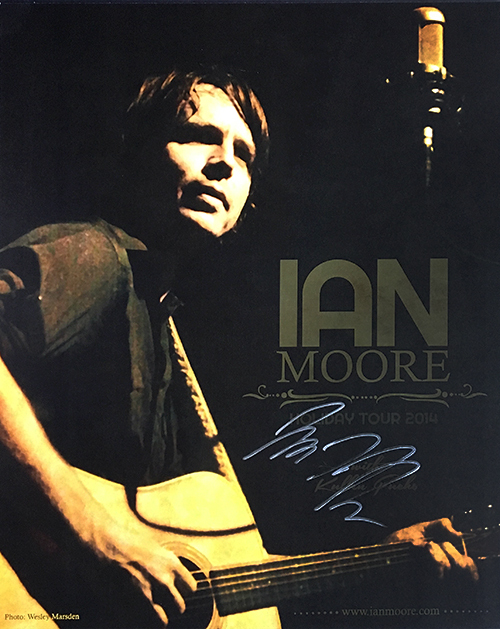 Description: Ian Moore Concert Tour Signature Guitar Pick. 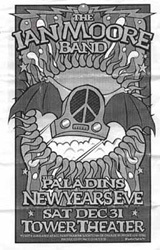 Description: 5x7 black and white 1988 concert flyer. New Years Eve concert. Note: This item in VG+ condition with some creases.